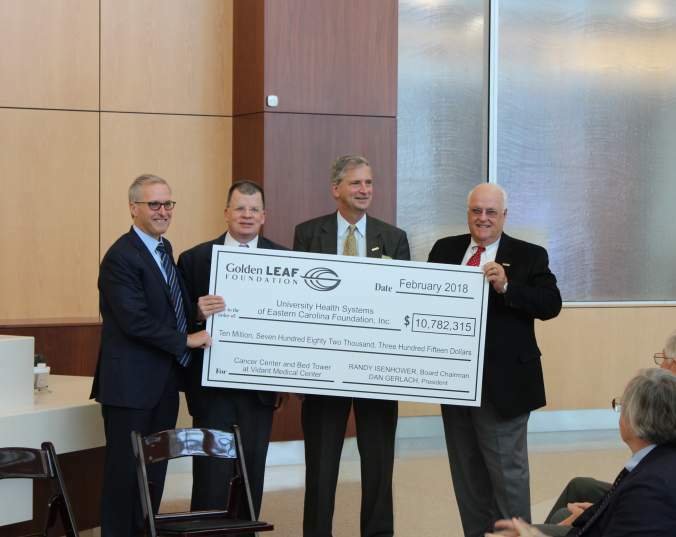 The Golden LEAF Foundation granted more than $10 million at the end of 2017 to fund major equipment for a new state-of-the-art cancer center and bed tower at the Vidant Medical Center campus in Greenville, NC. The facility will provide specialized healthcare services to residents of Eastern North Carolina, where a cancer diagnosis means a higher mortality rate compared to the national average. More than 7,500 new cases are diagnosed each year in the region. The Foundation’s grant will help purchase equipment including MRI imaging machines; a PET/CT scanner – an upgrade to current equipment; mammography, bone density and ultrasounds equipment; as well as video conferencing equipment to allow for improved access to medical technology and expertise in other hospitals and medical communities. Vidant Health is affiliated with the Brody School of Medicine at East Carolina University and serves more than 1.4 million people in 29 eastern North Carolina counties. In addition to filling a critical need for specialized health care in a rural part of the state, the Center will also create 197 new jobs and train 3,500 new healthcare professionals. Healthcare continues to be a growing industry and trained professionals are particularly important to underserved regions like rural, Eastern North Carolina. “This grant will result in multiple wins for Eastern North Carolina with both improved rural healthcare access as well as important jobs and professional training in the region,” said Dan Gerlach, Golden LEAF President.